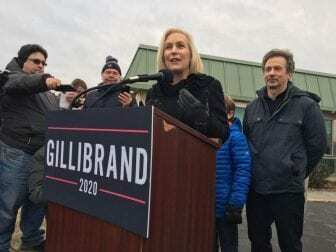 ALBANY, NY (WAMC) – Sen.Kirsten Gillibrand (D-NY) announced her intention to run for president Tuesday during an appearance “The Late Show with Stephen Colbert.” Hours later, the Democrat returned to her native Capital Region for her first campaign event. On a chilly January morning, at a roadside diner she called her favorite, Gillibrand made her White House pitch. “I’m going to run for president of the United States because as a young mom I’m going to fight for your children as hard as I would fight for my own,” said Gillibrand. The 52-year-old Democrat who was easily reelected to a second full term in November stood outside the Country View Diner, located, as she put it, a stone’s throw from her Brunswick home. Joined by her two sons, mother, and husband, Gillibrand said she stood on the shoulders of generations of Americans who have fought to make the country better. “So whether we fought to abolish slavery, or we fought we for suffrage, or whether we fought for workers’ rights and union’s rights, or whether we fought for LGBT equality or whether we fight today to make sure every child can breathe clean air and drink clean water, those are the fights of this country,” said Gillibrand. Gillibrand said she would fight for healthcare for all, oppose corruption in Washington, and would refuse PAC money. During her kickoff event, she criticized the Republican president, also a New Yorker, as a divider. “President Trump has chosen to tear this country apart against all racial lines, all religious lines, every division, every line you can find, and that is what we have to fight against,” said Gillibrand. Now a high-profile progressive in the Senate, Gillibrand first entered Congress in 2007 as a moderate upstate Democrat. She was appointed to the Senate two years later when Hillary Clinton became Secretary of State. Conversation started swirling about whether she would campaign for president during her 2018 campaign for re-election. She’s already facing heat from Republicans who are pointing out that Gillibrand said she would serve her full six-year term when asked directly during a televised debate. Facing reporters outside the diner, Gillibrand was asked when she changed her mind. Supporters were gathered inside the diner to greet the Senator, including local resident Elaine Bartley. She sees Gillibrand as “perfectly suited” for the role of president. “She is absolutely fearless and she is very principled, she will stand up for what she believes in,” said Bartely. With a year to go before the first votes are cast in the Democratic primaries, Gillibrand is joining what is expected to become a crowded field of presidential hopefuls, including several fellow Senators.